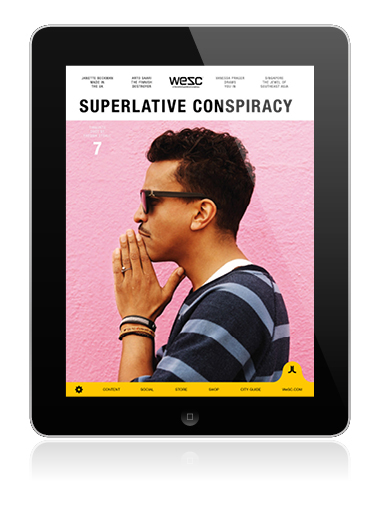 May 14, 2013—Global street fashion brand WeAretheSuperlativeConspiracy (WeSC) today launches iPad and iPhone editions of its quarterly print magazine – The Superlative Conspiracy Magazine, which WeSC creates in-house. The apps and the issues in it were created at mag+ Studios, a service to help clients create mobile applications, with Mick Drougett as Art Director. They reflect a growing trend for brands – not just traditional publishers – to engage far more fully with customers, via the medium of the app. The WeSC apps are designed to help the global brand stay close to customers even as it expands the business from Sweden, further into Europe, where it has its roots in Stockholm, to the US, South America and beyond. The beautifully designed apps are packed with high quality visuals, including videos and still photography and are fully interactive. They also offer powerful, easy to use e-commerce functionality – readers simply tap the images of featured WeSC clothing and accessories to purchase items direct from WeSC.com – as well as other features such as City Guides, videos, music, articles and more. Social-ready, WeSC editions for iPad and iPhone include built in sharing via Facebook, Twitter, Instagram and other popular networks built in. Both apps were made at mag+ Studios, using the mag+ digital publishing platform, which is the industry’s most creatively flexible, efficient and cost-effective way to create mobile applications. They use the mag+ dual layout system, where content can be varied when the device is rotated from portrait to landscape. The iPad version also uses the platform’s brand new Overlay Layer feature (available soon in mag+’s coming 4.2 release). This provides a layer of content that sits above the other pages as they swipe beneath it. Here, it acts as a navigation layer, providing a permanent menu for jumping around the issue. “Our brand is created by, with and for people who make music, art, skateboard, create things, and we like to share their stories as well as our own. This is what makes a brand – it’s what makes WeSC what it is today. The Superlative Conspiracy Magazine is our way of gathering all the creativity and people who inspire us all in one place – and telling their stories. This is what the app is all about: sharing the stories further on a new digital platform, something we are very excited about,” says Greger Hagelin – CEO and Co-Founder of WeSC. See more information and a video of the WeSC app.